Can one person’s artistic vision create change and protect something astounding? The Grand Canyon of the Yellowstone by painter Thomas Moran, 1904. In the case of painter Thomas Moran, one man’s art was a major influence in preserving what is now one of the world’s most cherished places: Yellowstone National Park. Long before America had a National Park Service or a National Park System, mountain men and trappers roamed the Yellowstone region. These early European visitors tried to describe this unique place to friends and family back home, though their elaborate stories could hardly capture the area’s majestic features. 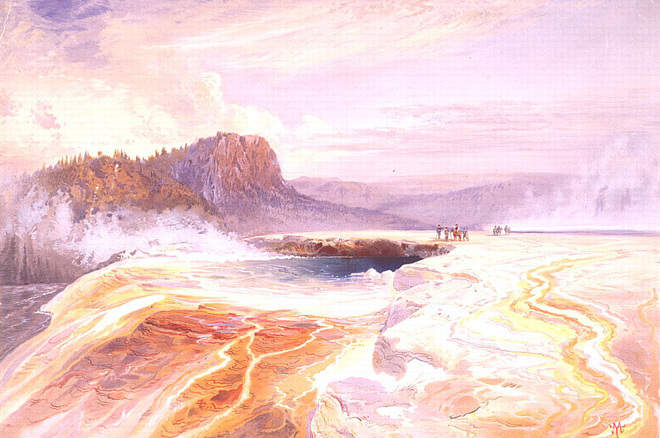 Yellowstone Lake by Thomas Moran/Library of Congress. As the legend goes, one such visitor—John Colter—was a member of the Lewis and Clark expedition in 1806 when he left the group to join fur trappers traveling through the Yellowstone region. Although historic accounts vary and no one knows for sure whether Colter actually made it to the area now preserved as a national park, he allegedly battled with Crow and Blackfoot tribes and fled across the plains, wounded but alive. As he trekked near the modern-day Yellowstone region, he came across a place of “fire and brimstone,” which was later nicknamed Colter’s Hell. Listeners assumed that Colter was hallucinating from his injuries and took his stories for myths. These “myths” told by visitors continued for decades. Finally, in 1871—65 years after Colter claimed to have found his “hell”—the first federally funded geological survey set out to explore the Yellowstone region. This expedition was led by naturalist Ferdinand Vandeveer Hayden, then-director of the U.S. Geological Survey. Hayden had attempted to visit the area as part of a different expedition in 1860 but couldn’t pass the Continental Divide due to heavy snows. The Great Blue Spring of the Lower Geyser Basin, Yellowstone, by Thomas Moran/Library of Congress. Among the 32 members of the survey was guest artist Thomas Moran. The 40-day expedition allowed Moran, along with photographer William Henry Jackson, to visually document over 30 different sites, including present-day Old Faithful, Hayden Valley, and Grand Canyon of the Yellowstone. This unique partnership with Moran and Jackson was critical to Hayden, who included their art in a comprehensive report to Congress. 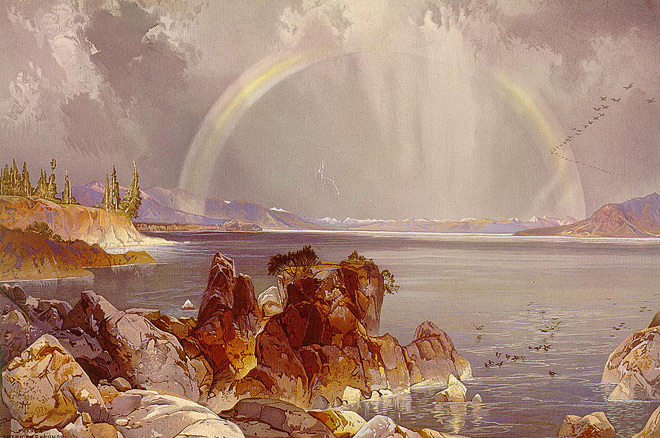 Jackson’s black and white photos documented Yellowstone’s unique geological formations while Moran’s paintings and watercolors captured its diverse and extravagant colors. These photos and paintings not only won the attention of Congress, they also captured the imagination of the nation. Historians credit these inspiring images with showing the grandeur of the region and persuading Congress and President Ulysses Grant to establish Yellowstone as the first national park in 1872. Thanks to some paint and creative vision, Moran and Jackson finally transformed 75 years’ worth of barely believable stories into visions of beauty worth protecting. That’s worth a thousand words. And then some. Grand Teton’s Mount Moran is named after Thomas Moran. A popular viewpoint by the Grand Canyon of Yellowstone was named “Moran Point” after the artist. Yellowstone had such a significant impact on Moran that he adopted the signature T-Y-M, Thomas “Yellowstone” Moran. The government purchased Moran’s first large painting, The Grand Canyon of the Yellowstone, in 1872 for $10,000. Megan Cantrell worked at National Parks Conservation Association for 10 years, much of that time shepherding NPCA’s social media program.